Yesterday, I made a skinny open sandwich, with Taco seasoned ground beef. I usually buy reduced sodium Taco seasoning mix, but not anymore since I came across an easy homemade recipe. I really encourage you to make your own homemade Taco seasoning. You probably have all the ingredients in your pantry. I got this Taco seasoning mix recipe from here @Specie Foodie. For the topping, I used Habanero Heat shredded cheese (Kraft). I just discovered this spicy cheese, and my family loves it. I used about a tablespoon or so in my sandwich, but you can use any reduced fat cheese of your choice. Then, add the ground beef and cook, breaking up the meat into very small chunks. Keep stirring until fully cooked. Drain the meat, and then add Taco seasoning. Stir until well combined with the meat. Reduce the heat to medium low, and add the tomato sauce. Simmer the meat for mixture for about 10 minutes stirring occasionally. Add more tomato sauce if you like your sandwich a bit saucy. 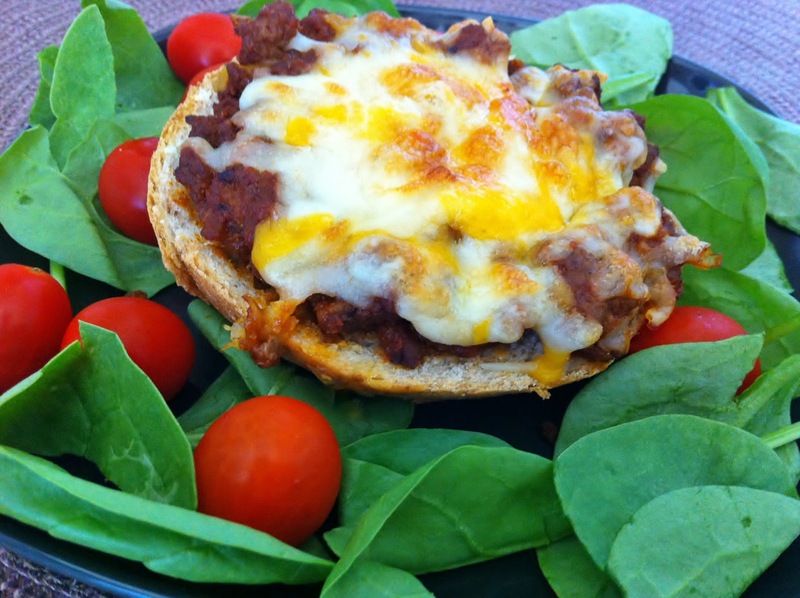 Heat hamburger buns and spoon some ground beef, then top it with shredded cheese. Serve with any side you like. Mmmmmmmmm............this sounds delish! I must try it. I've never made my own taco seasoning but you are right, less salt is way better! It was my first homemade taco seasoning as well! !